Your infant cannot protect himself against loud or harmful noises, so it's up to you to safeguard against damage to his delicate hearing. Understanding what noises can be harmful to your baby -- including sounds from loud toys -- can help you pinpoint noises that could harm him. Because damage to your infant's hearing can lead to permanent hearing loss, early intervention is vital. 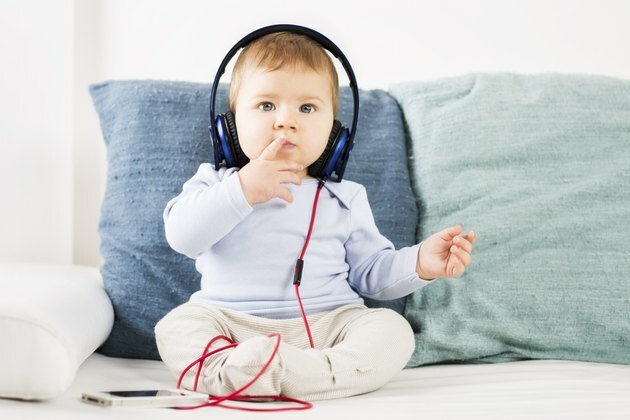 Infants are especially susceptible to hearing damage from loud noises because their skulls are thinner, according to the Women's and Children's Health Network. Prolonged or sudden exposure to loud noises can damage parts of the inner ear -- the area responsible for hearing -- such as the outer hair cells, inner hair cells and nerves in the inner ear. Damaging even one quarter of these cells can cause hearing loss. Safe levels can vary according to the duration of the exposure. For example, an adult using a very loud hairdryer can damage her hearing over time. Because your baby cannot tell you how loud is too loud, use a general rule of thumb, that noises less than 80 decibels should not cause hearing damage, according to The Children's Hearing Institute. This is the equivalent to noise in a restaurant or in city street traffic. A normal conversation is about 60 decibels. Your baby's toys can be excessively loud, even those intended for infants. While the 80-decibel level applies to noises that are farther away, your infant may hold toys close to his ears, which can be very harmful. Some toys can inflict as much as 120 decibels of exposure to your infant, which is the equivalent to hearing a jet plane take off, according to the American Speech-Language-Hearing Association. Toys that could pose a problem include cap guns, speaking dolls, cars with sirens, muscle instruments and toys that have cranks, such as jack-in-the-boxes. Always listen to toys before purchasing them and remove batteries if a noise is battery-powered. While you may not always be able to protect your child against sudden loud noises, such as a jackhammer on the street, you can take precautions, such as purchasing noise-canceling headphones when going to locations that could be loud, such as a movie theater or a public festival. If you are concerned your infant may have experienced hearing loss, talk to your child's physician who can recommend testing. How Can Sound Damage Your Ears? What Causes Shooting Ear Pain & Ringing?